Before we get into specifics in relation to wedding styles, let’s discuss some trends that have occured in 2018. Each year, there are new wedding ideas and creations that come about through talented coordinators, florists, and vendors. We will discuss the various colors schemes, which foods and desserts guests are enjoying, and the experiences that will forever be cherished for each individual. The bride and groom have a desire for their guests to notice the effort and hard work that has gone into planning their special wedding day. It’s more than personalizing the wedding to them, it's also about who their guests are and how much they mean to them. The color of the year is purple, you will be seeing it plastered on the floral designs, the bridesmaid dresses, invites, and even napskins! You name it and the color will be there! Plus it goes well with gold accents, creating a very classic and luxury look. Speaking of colors! It seems like a lot of couples aren’t sticking to the classic white and green palette. Weddings this season are incorporating more pops of vibrant color. It may be tones of bright peaches, yellow and even touches of lavender for a pastel feel. Specifically, draping can play a major role in introducing color into your wedding theme. Cute little dessert tables are a must-have nowadays. Even though we are still obsessed with our wedding cakes, people love having a variety to choose from. Whether it be cookies, doughnuts or even the kettle corn that Elements of Style created above; it’s a way for everyone to enjoy more sweet treats. It seems like industrial metallics are the way to go! By incorporating copper or rose gold, it adds a nice touch to almost anything you can think of. From signs to menus, expect these metallics at all the weddings in 2018 that you'll be attending. Having signs may not be a necessity, but it’s fun! It gets guests talking and adds a personal touch to the whole wedding. It can be clever directional signages or even meaningful lyrics displayed near the bar or dessert table. You must love the standard wood and chalkboard design since it will always be a classic for rustic or vintage weddings! Keeping it simple! A smaller guest list is obviously more intimate and enables the couple to interact with their loved ones. With a small gathering, it means having the opportunity to have their main focus on the delicious food. 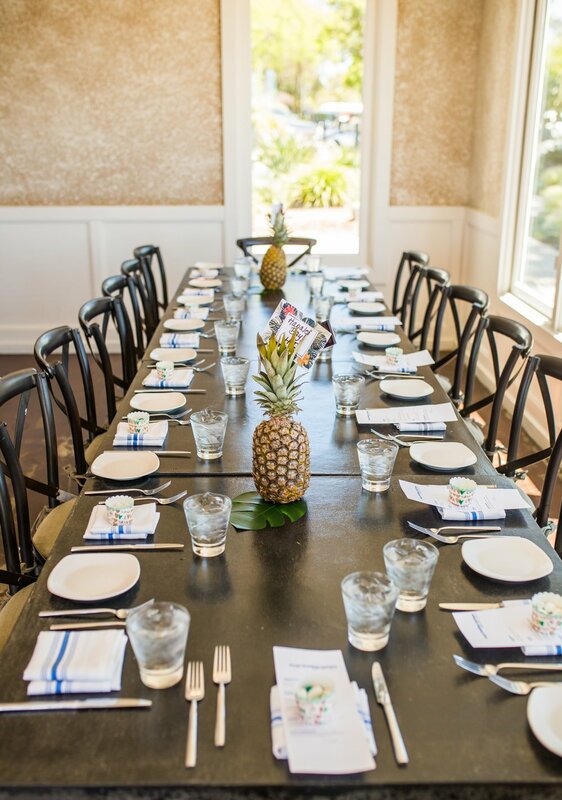 The bride and groom have the ability to work closely with the caters to create a personalized menu for their guests. Since there are less tables and a tighter arrangement, the vibe becomes much more down to earth and special. There you have it, a handful of famous trends this year that you should keep your eye on! Elements of Style is unbelievably excited to share more details on specific wedding styles, so stay tuned! What are moonlight weddings? It’s an evening wedding that is very romantic and intimate for a bride and groom. More and more couples are desiring this type of wedding because it’s unbelievably beautiful and breathtaking. Don’t get me wrong–daytime weddings are amazing, but there’s just something special about ceremonies under the stars and illuminated by the moon. It brings the phrase, "I love you to the moon and back into a reality." There’s no need for research with the help of Elements of Style, we will help you through it all from the location, any lighting needs, to the flowers, officiating, caterers, and of course the candlelit. Oh yeah, we are big on the candle lights! You name it and we will take care of it! The owner, known as Mary Bowerman, has figured out a couple of tricks to make evening weddings really pop. 1. Lots of candles. Well, obviously, right? We can do candles in lanterns, candles on trays, hanging candles. candles with messages in a bottle, and whatever the couple’s preferences may be. Recently, I witnessed a couple with several luminaries lining the sidewalks and stairs. It was simply stunning. We can even give everyone a candle and ask them to share their light before the vows. 2. What’s a wedding without some twinkle lights? We make sure to use amber warm lights, not cool ones, so that everyone looks flattering in that wonderful moment where bathed in candlelit. 3. We can even do a backdrop since we have hundreds of props to choose from. You can be next to it, under it, above it, whatever your heart and vision desires! 4. Turn the music to half the level it’s normally at, this make it very subtle as the bride makes her entrance. Part of the beauty of getting married at night is the stillness, and the music should be a nice accompaniment to the romance in the evening, not the center concert stage. Balboa Park: There is a majestic beauty about this place and it offers such lovely settings for any type of wedding! From the museums, fountains, to the gardens; you can’t go wrong with the reflection from the water! Toes in the Sand: This is an amazing beach wedding that you may be looking for. Waves are crashing and the bright moon is shining over the water, your toes are in the sand and your heart fills with love and joy when you say and hear the words “I do.” Plus there’s just that feeling of being barefoot, free, and in-love that can only be offered in this setting! Coronado Island: With the Hotel Del Coronado in the background and the soft grains of sand against your feet, it’s perfect for elopements or ceremonies. It’s honestly a beauty in its own. Nothing gets better than this vintage charming background and the beautiful ocean that comes to you for the evening. Windansea: What a gorgeous wedding setting and the heart of Bird Rock. Imagine celebrating with a small group of people that you love in a laid-back style with rolling waves in front of you as you are nestled in the cliffs. This is literally heaven on earth! Sunset Cliffs: All you need is the wind in your hair and the people you love most to create an unforgettable wedding day! Create a big moment in your relationship through a place above the ocean. Imagine a cliffside wedding overlooking the Pacific Ocean, it’s the most natural choice for two people to start their new life together. After 20 years in the wedding business, Mary can set you up from the beginning plans to executing the final day. 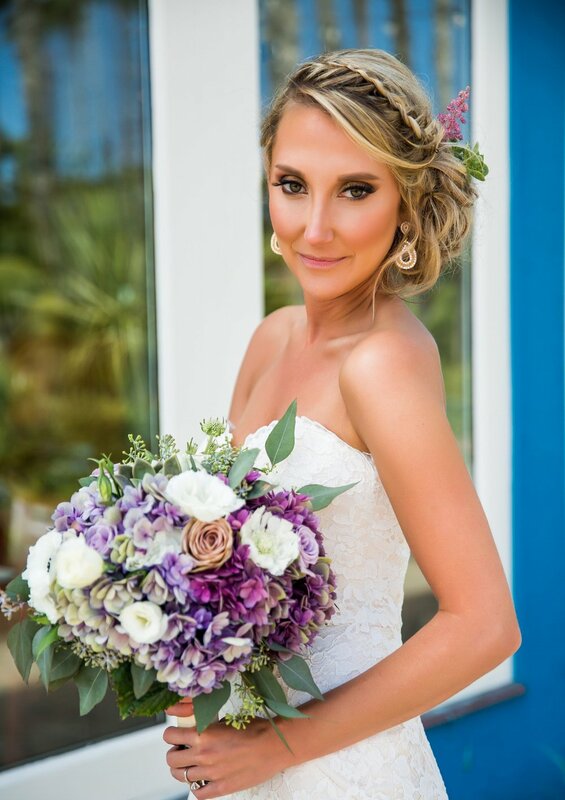 From brainstorming the perfect location, to coordinating you down the aisle, to a wonderful celebration dinner, to recommending the best hair and makeup for you; we will help to make it all perfect! You don’t want the catering or the restaurant recommendations? We can just do specialty desserts and simple drinks, or champagne and cake. It’s all about your wants and needs; we are skilled at creating memorable weddings, vow renewals, or anniversary celebrations! Pop-up Weddings are perfect for couples that have already done the big wedding years before or want something small, simple, and sweet. How does it work? Your friends and family have no idea that you are getting married or celebrating an anniversary. You can invite people over for a small gathering, it can be a barbeque event or just a nice dinner at a restaurant. You could even do something at home or at the beach. We will have one of our officiants pop in and orchestrate the ceremony along with the popping of your favorite bubbly, the cutting of your small lover’s cake, or any personal item that means a lot to you. He or she will let everyone know that the couple is getting married that night. Yes, the only people who know about the event are the couple! Then the rest is fairly easy, the two lovebirds will get married in front of all their loved ones! There’s no place cards, decorations, it’s just a simple pop up wedding. No need for invitations, wedding dress fittings, tuxedo mishaps, no maids of honor, no best man; it’s just the people you love most. You don’t need the gifts, you don’t need the floral arrangements; you just want to get married or celebrate the years of marriage you have spent together. Are you concerned about how the vows will work? We can share beautiful vows with you or you can both write your own. In our perspective, couples can have this opportunity to surprise the most important people in their lives with this spontaneous event. Also, children can be included into the ceremony if you are blending your families together. We can incorporate as many people as you want into the wedding celebration. Remember this is a surprise for the guests and a unique way of truly treasuring this moment with the people dearest to you. Whether it’s for vow renewals, anniversaries, a small wedding; Elements of Style is here to make your day special. The rustic theme seems to be what every bride is talking about. The whole idea of a rustic wedding is that it’s not too complicated or elaborate. Even though it’s more laid back, you can still embrace and incorporate the traditional aspects. Rather than having the detailed fondant icing, think about a beautiful cake with a smooth buttercream finish dressed with some flowers of your choice. The location plays a major role since you want to create the perfect rustic mood. You definitely want something that takes full advantage of Mother Nature such as a mountaintop, a farm, or even a lakeside. However, you can transform any venue of your choice or budget to a Rustic Theme with the right components. You can create, a barn like feel when you enhance the small details of burlap, farm tables, wooden elements, and mason jars. Several materials that are an excellent addition are lace, burlap, woodsy loose branches, candlelight (lots of it) and natural twine. The best part about these items is that they are just as beautiful as they are practical and inexpensive. Specifically, burlap is often used as a base material for a table runner or cloth. They also wrap gorgeously around vases and candles. As for twine, it can be utilized to tie bouquets, string up lanterns and photographs, and hang mason jars on the side of the chairs. The best part is when they are incorporated with lace because it creates a sweet and lovely look for the décor. Without a doubt, a rustic wedding focuses on a neutral palette which is the main reason the bride will add a vibrant splash of color into the bouquets and boutonnieres. Majority of people will go towards wildflowers, herbs, or native bouquets for a feeling of authenticity. By mixing a range of flowers in whatever color you may desire, it will work magically with this type of wedding. The last thing for a perfect rustic wedding are mason jars. It’s practically incorporated into every decoration you can imagine. You can use it as vases on the tables, candle holders, filled with something delicious for a favor, . The most common thing wedding coordinators will do is hang them from the chairs on the edge of the aisle at the ceremony, with fresh flowers of the bride’s choice then move them to tables for a centerpiece. Bohemian weddings seem to be what every bride is talking about. It has an outdoor, relaxed look that combines with an artistic vibe. A consistent aspect of this particular type of wedding is the earthly element. Expect to see rich color palettes, and textures scattered throughout the event that represents the beautiful couple. They want a wide range of things to enhance the look and feel of the wedding, including crystals, dreamcatchers, cascading bouquets, flower crowns, and colorful textiles. Time to get into more details! For starters, let’s talk about the linens for the wedding day! For instance, woven fabrics such as macramé and crochet textiles can be used for a wall hanging backdrop for the ceremony. It’s also wonderful for framing your cake and placing potted plants in crochet holders. There is a style of cotton and woven linens that are new and setting a beautiful trend. It seems like the lounge look is a must-have nowadays. You will see decorative rugs and pillows scattered around the outdoor setting for a picnic-style lounging. In addition, you may also discover adorable tents or teepee structures to fit a few guests. Time for our favorite part! The bohemian bridal bouquet has oversized flowers, in a cascading shape. Honestly, each flower is chosen for a special meaning and it makes a bride’s bouquet more personal to them. They appear to be hand picked and delivered by a very special lover! For the reception, the centerpieces are surrounded with lush blooms in an array of colors from bright tones to soft pastels. Depending on the bride, you may see vessels on runners of decorative woven textiles or macramé. Get ready for the flowing lace and natural details that surround the soft florals because all of these little details create an effortlessly beautiful bohemian wedding! It seems like the well-known Rustic wedding isn’t the only trend occurring these days. There’s a new wedding trend dominating Pinterest boards and Instagram explore pages, which are Industrial weddings! This type of wedding design is a clean and simple style that enables couples to choose a couple major details. The final result is very modern and minimal, nothing super flashy. The beauty of this wedding is the contrast of it all, from soft lace dresses against concrete walls, to the copper or brass poking through the green plants. Most of the times, you stick to clean lines and metallic accents when creating the florals. It is highly recommended to keep the color palate clean and to focus on neutral flowers or even greens. 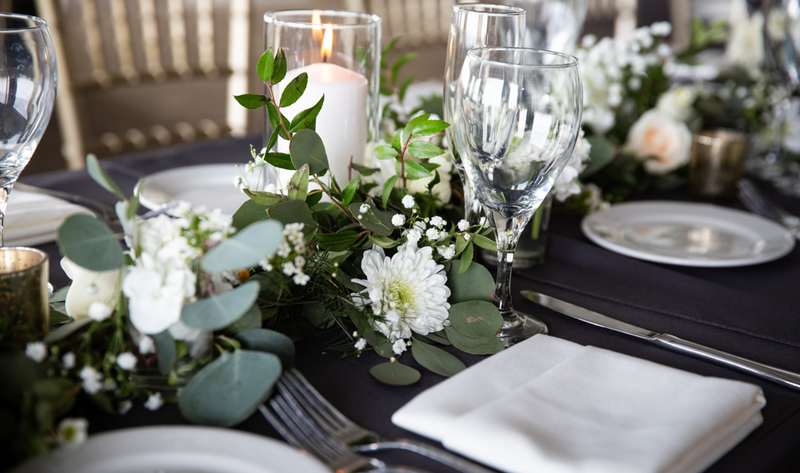 For instance, using Israeli Ruscus, English Ivy, and succulents are perfect for this occasion. Brides love the contrast but still keeping some softness and delicacy. By using delicate whites and pastels like Ranunculus, lilies, roses, and orchids are a gorgeous solution to add a natural touch. There are specific light bulbs that have a lot of popularity when it comes to versatility. You can hang them from the ceiling to the floor, over a backdrop/prop, or overhead above tables to add an intimate “bistro feel." A huge wow-factor of this wedding theme are hanging metal geometric shapes throughout the location. By wrapping Eucalyptus around metallic hoops and frames, it creates a finished look. Also, adding distressed wood tables that are uncovered will pair nicely with brass chairs. By using brass or copper cutlery, it’ll tie in nicely with the overall look. You will see factories and industrial buildings being revamped for wedding venues, it can bring the vision to life because of the brick or concrete walls. Always remember that incorporating flowers and texture alongside everything will create the perfect Industrial Wedding. What makes Mary different from other officiants? After years of a beautiful marriage, I learned that there is so much joy and sorrow that comes with a relationship. I realized life is filled with ups and downs; thus, it means a tremendous amount to me in being such a major aspect in the wedding. Certainly, it is an honor to stand by a bride and groom, and bring their families together. By being an officiant, I have the opportunity to be a part of another chapter of any couple’s journey. The perspective of being literally in front of them is only possible as an officiant, which makes me love my job even more. Bringing out experiences the couple has undergone together will showcase a side that the guests have never seen before. They have the ability to share their life challenges with the unconditional love they have for one another. Witnessing a love where two people experience joyous success and heartbreaking loss makes being an officiant worthwhile. I love hearing about a couple’s reason in wanting to do and be better. The day they become husband and wife is just the beginning of them growing together and conquering the world as a team, which is why I want to be a part of that. Nothing means more to me than knowing that I have given a couple the opportunity to live and love, to give their heart fully to each other. I never want to retire from this because I have found my dream job and this is something I plan on doing forever.